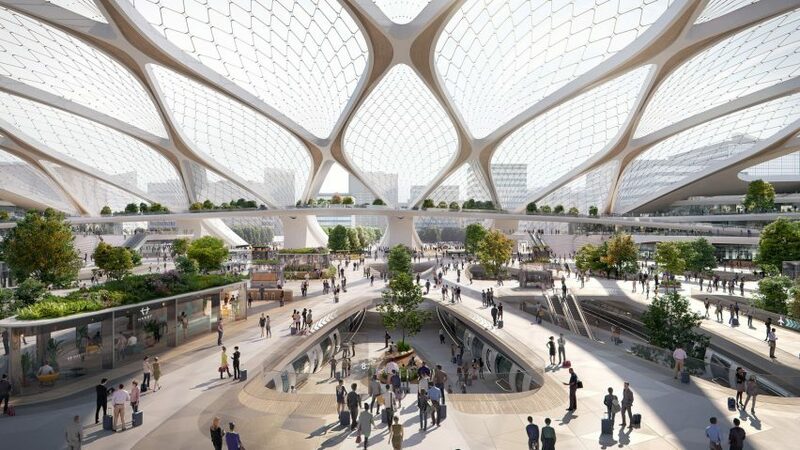 UNStudio has presented its vision for a series of adaptable and modular "stations of the future" for a future European hyperloop network. The Ben van Berkel-led practice imagines a concept station made from tessellating components, meaning that it could be adapted and expanded to fit into various locations. The idea is that this system could be quickly and easily rolled out to numerous European cities, allowing them to implement a hyperloop system – a technology that could transport passengers between cities at speeds of up to 700 miles per hour through semi-vacuum tubes. UNStudio designed the station for HyperSummit, which took place 12 September 2018. Organised by Hardt Hyperloop, a European company technology and transport company, the conference aimed to explore how a European hyperloop could be realised. In UNStudio's concept, called Station of the Future, modules can be assembled to create a variety of different solutions. They include smaller stations that fit within tight urban contexts, medium-sized commuter stations, large transport hubs, and extensions to existing transport interchanges. "Existing cities mean existing parameters, and UNStudio envisages a symbiotic relationship with its local environment: an integrated piece of an urban composition," said the studio. Unlike the majority of traditional railway stations, the platforms in UNStudio's concept would be curved rather that straight. According to the studio, this is possible due to the "speed of the hyperloop vehicles", and would give the buildings "an inviting organic form to soften the geometry of the module". Along with modular platforms and roof, the station's public level would contain modules that could contain numerous functions such as luggage check-in, bicycle docks, daycare or pocket parks. UNStudio envisions that the stations would be solar powered, but would also operate as batteries for solar power collected on the hyperloop network. According to Ben van Berkel, buildings will function as batteries in the very near future, providing energy not only for their own immediate needs, but also for surrounding public amenities and transportation modes. "The hyperloop is not only a realistic and viable alternative to flying, it is going to revolutionise travel," said Van Berkel. "It will provide extremely fast travel times with direct connections between cities, enabling completely new ways of working and spending our leisure time, which in turn will lead to a multitude of economic, environmental and knowledge exchange benefits." Unlike typical railway stations, platforms would be curved rather that straight. This is possible due to the "speed of the hyperloop vehicles"
UNStudio is the latest of several architecture studios to envision how a future hyperloop network and its stations would look. Foster + Partners recently unveiled a concept for a cargo-carrying hyperloop network, while BIG is working on a design for a hyperloop system in Dubai.